This class is for all skill levels. The student will draft and create their own pattern and use direct appliqué to create a unique version of this design. 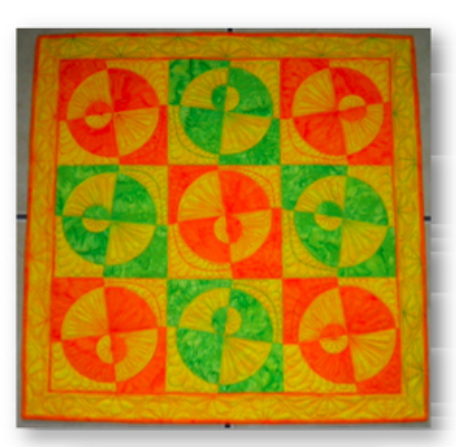 Some simple machine quilting instruction will be included. Fine accent border and binding techniques will be demonstrated. Direct appliqué and machine quilting work together to make this cheery wall quilt. (student’s option on colour way.) approx 50cm square pattern. All fabrics should be 100% cotton, prewashed and ironed. This original pattern was created using the STARWHIZ tool. The funky ten piece squares were then arranged in a not-so-traditional nine patch arrangement.